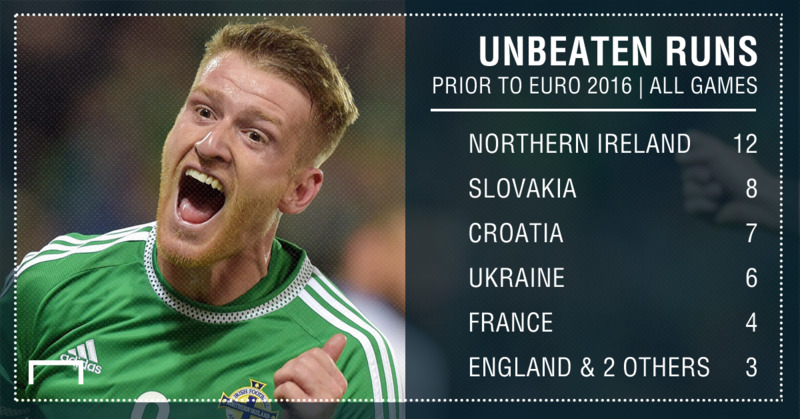 Northern Ireland are on fire - Euro 2016 attacks are terrified! ‘Will Grigg’s on fire – your defence is terrified!’ It’s the song set to take over Euro 2016 as Northern Ireland get their campaign under way, but Michael O’Neill’s side are about far more than one fan favourite who is unlikely to even start in France. Having topped their qualifying group, O’Neill’s squad arrive at a first major tournament in 30 years with the longest unbeaten run of any of the 24 competing countries. Their last defeat came in March 2015 as an under-strength side slipped to a 1-0 loss in Scotland, with no other side even close to matching their 12-match unbeaten run. And while goalscorer-in-chief Kyle Lafferty and Grigg are likely to garner the most interest into Sunday’s clash with Poland, it is the defence that O’Neill has put together that will likely be crucial if they are to emulate their World Cup successes of 1958 and 1982 when they reached the latter stages. Jonny Evans, Gareth McAuley and Craig Cathcart all come into the tournament off the back of Premier League campaigns while veteran Aaron Hughes brings valuable experience despite having swapped English football for the A-League in Australia. Factor in Manchester United youngster Paddy McNair – who may be switched into a deep-lying midfield role if recent friendlies are anything to go by – and even Robert Lewandowski and Thomas Muller may find it difficult to break through as Group C goes on. That defensive unit have conceded just one goal in their last five outings dating back to November. Detractors have pointed to the fact that both during qualifying and in their recent non-competitive clashes they have yet to face teams of the standard they will come up against at the Euros. However, the confidence that comes with continued clean sheets could yet prove the difference as Northern Ireland look to upset the odds and make their way to the knock-out stages. Form and confidence can only take you so far, however, and for a team ranked 25th in the world to reach the last-16 would be an achievement in itself. A fit and firing Lafferty suddenly gives them a cutting edge in front of goal, but with doubts over his fitness remaining, Grigg may well be the man to step up and lead the line. Whether he can replicate his Wigan Athletic form on the biggest stage remains to be seen, but it is those behind him that hold the real key to success. Euro 2016’s strikers might be the ones feeling terrified once Northern Ireland kick-off.